The word “Bimbo” in common English usage refers to an inept person, an airhead or a “cheap” flirtatious “dumb blond”. 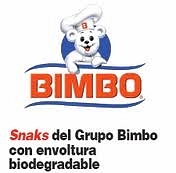 In Spanish, “Bimbo” has no particular meaning, but is the name of Mexico’s predominant bread baker, a massive multinational company. It is so well-known that in many parts of Latin America, packaged, sliced white bread is often referred to simply as “pan bimbo”. Grupo Bimbo is the world’s largest bread baker and fourth largest food company on the planet behind only Nestle, Kraft and Unilever. The firm has a presence in 17 countries, supplying consumers with more than 150 brands, via a network of 42 plants in Mexico (see map), 25 elsewhere in Latin America, 34 in the USA and 2 in China. It is currently the only bread company that has a national footprint throughout the USA. While most people may not be familiar with Grupo Bimbo as a corporation, virtually everyone in the Americas at one time or another has consumed Bimbo products. The company makes over 7,000 different products using various brand names, including Sara Lee; Thomas’ English Muffins; Entenmann’s pastries; Arnold’s, Orowheat, Mrs. Baird’s, Wonder (in Mexico only); Freihofer’s; Stroehmann’s; Brownberry; Old Country; Milpa Real and Tia Rosa (tortillas and related products); Barcel (chips and salted snacks; Marinela (sweet snacks); Boboli (pizza crusts); Coronado (cajeta) and El Globo fancy pastry and coffee shops. How did Grupo Bimbo get to be so big? Grupo Bimbo was established in Mexico City in 1945, and has grown mainly through acquisitions. In 2008 it paid $2.4 billion for the US food operations of George Weston Foods Ltd of Canada. In 2010 it bought Sara Lee’s fresh bakery division for about a billion dollars. These acquisitions enabled Bimbo to double its total revenues in the last decade to almost $10 billion. Grupo Bimbo has a worldwide network of more than 41,000 distribution routes serving an astounding 1.8 million points of sale, varying from tiny corner stores in remote villages to major supermarkets in big cities. In recent years, Grupo Bimbo has been busy boosting its green credentials via a series of environmental initiatives. These include a 90-megawatt wind park in Unión Hidalgo in the state of Oaxaca, which will generate almost 100% of the power Grupo Bimbo requires to run its plants in Mexico, and will be the largest wind park in the global food industry. It will diminish Grupo Bimbo’s environmental footprint and mean that almost half of Grupo Bimbo’s total global electricity consumption will come from renewable sources. Grupo Bimbo is one of only ten Mexican companies that have earned the Socially Responsible Company Award from the Mexican Center for Philanthropy (CEMEFI) for ten years in a row. The company is involved in numerous environmentally and socially-responsible initiatives, including Reforestamos Mexico, an NGO committed to protecting Mexico’s forests and rainforests. This has worked with young people from 40 rural communities to help restore forests and raise awareness about the need for certified forestry products and forestry carbon certificates. That sounds a little bit too much like homework for school vacations! On a more serious note do you have data mapped to see if there is any correlation between Bimbo distribution and type 2 diabetes? The short answer is “no”, sadly we don’t. 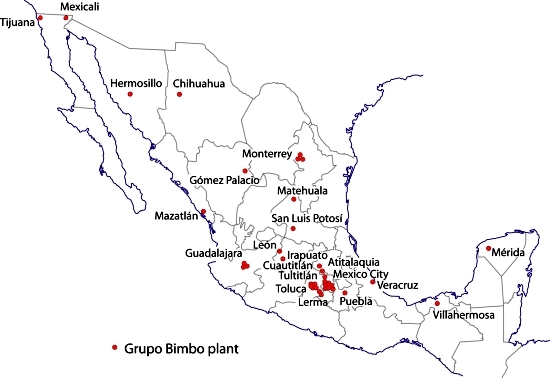 Bimbo reaches virtually every nook and cranny throughout Mexico, so I can’t think of an easy way to come up with a “Bimbo Index” [sales volume/100,000 people? ~ maybe some summer vacation homework needed?] for which the data would be available and which might have a distinct pattern that could be compared with the pattern of type 2 diabetes. However, it’s an interesting idea, and we’ll keep it in mind. It was an interesting article meant to inform and that it does well. Why would we want to turn it into a statistical study of sugar addiction and its consequences? Relevant as that topic is, it has no place here.